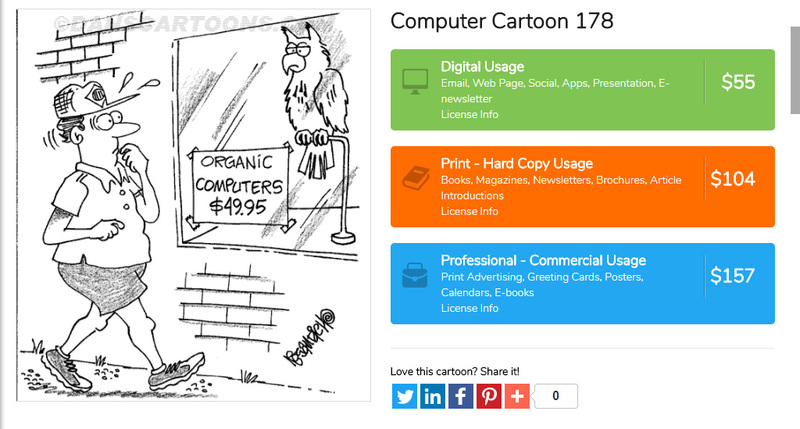 Organic computer cartoon shows an owl for sale in a store window! This is the type of cartoon humor you can expect to find throughout the rest of my catalog of computer cartoons if you want to use quality technology cartoon humor. 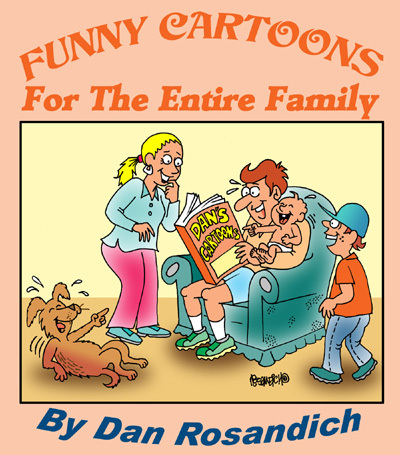 I try to think out of the box when it comes to writing gags for cartoons I want to offer the professional market. Writing can sometimes be difficult, in fact aggravating in that it’s easy to encounter “cartoonists’s block” – similar to writer’s block. The other aspect I like about this particular gag panel comic is the fact it’s one of my captionless pantomime cartoons which are a favorite of mine to create. Cartoons that can tell a story without any cartoon word balloon or gagline underneath the image have a different appeal. They make the reader think for a few seconds and look at the actual cartoon in order to absorb and understand the message. This cartoon featured in this article can be licensed for any professional or commercial usage. You can have anything modified in the overall image. Editing any cartoon to fit your needs can be easily accomplished! The price on the sign in the window can be changed, or I can redraw the character walking and change it to a female cartoon character, or if you see potential in using this cartoon in a print advertisement, I will colorized the artwork and format the cartoon into a high resolution TIFF file for your convenience. 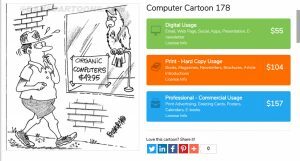 Editing cartoons is a part of the services I offer so keep this in mind when you have questions regarding any of the cartoons found throughout my catalogs. If you want to talk about something specifically, just tell me what numnber to call and I will immediately call you, no problem.